What happened with product management in 2016? A lot! 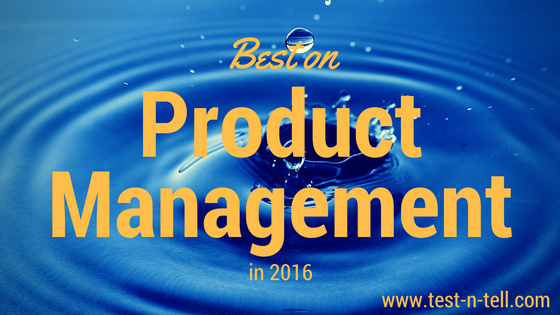 Bellow you'll find a very arbitrary list of best product-related content in 2016. Inspiring stories of what product management is all about - bringing value to customers and company. Remember you're responsible for bringing the value not story points. Product owners come in different "shapes." Identify your "belt" and what in-front of you to succeed. Every product needs a vision. As a PM you need a vision even if nobody else bothered. Your product is a reflection of your organization structure. Keep on improving your PM processes. You will always have more ideas than resources to realize them. Remember that DYI costs a lot. There is nothing worse than an engineered product nobody uses. Before you build stuff, make sure a problem exists. For complex and big products one PO/PM might not be enough. Scale your product function the right way. Your customers don't need graphs, they need insights. Think if conversational UI could help your customers better complete their goals. If you're into video content, check this list full of PM wisdom from the biggest community of product managers on the planet. Advert-size bites of video on building a company, on products and on social media. Good humor on the way. Product management knowledge comes in all possible shapes, including audio. Here is a list of Product Management Podcasts for you to benefit from while on the go. 2016 was a fruitful year for Product Managers. More and more companies realize the critical role product management plays for the success of their enterprises. Product management community continues growing with more ambitious professionals seeking to improve their product skills. 2017, hopefully, would bring even more success cases, new best practices, and productive networking to our friendly community.